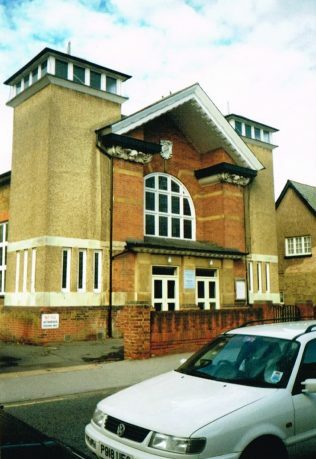 In the first half of the nineteenth century, Chalvey was a small village of around 60 houses. Primitive Methodists first met in a house or open air and then in 1854 bought, for £250, a second hand chapel – Zion – from the Congregationalists who were moving to bigger premises. The Primitive Methodist magazine of August 1854 includes an account by D. Mossop of the opening on Sunday April 25th and following days. Sermons were preached by Rev G Lamb (London), Rev W Knight (Slough) and Rev J A Miller (Windsor). The Mayor of High Wycombe, J Hunt Esq chaired a tea meeting in the Temperance Hall, with support from Revs J Mules and W Knight and Mr J Mills. As the village continued to grow land was purchased and a new church opened in 1901. Many Primitive Methodist chapels were simple, almost barn like buildings. This one is rather grander. For twenty-one shillings (£1.05) you could lay a foundation stone with your name on it; for two and sixpence (12½p) you could lay a stone – but no name. A fuller account of its history is available on the Circuit website.